Axis bank is one of the top private sector banks operating in India. They offer a variety of services like savings account, current account, credit account, fixed deposits, demand drafts, and much more. 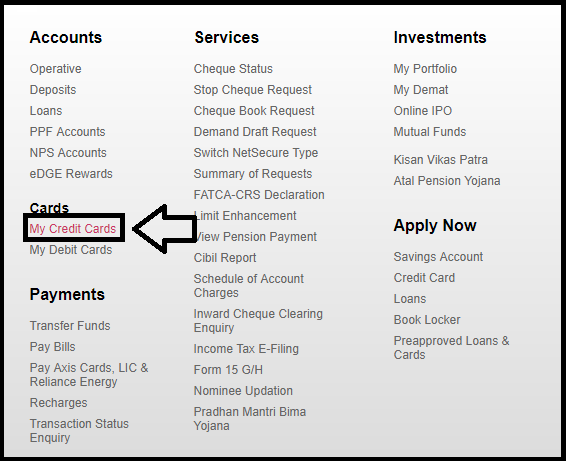 Axis bank credit cards are affirmative in terms of convenience and features. With the proper use and management, one can get a free credit period of up to 45 days. Credit cards are also managed by different organizations, like MasterCard, VISA, Rupay, etc. VISA usually attracts more offers but is reserved for higher accounts and usually attracts more fee than MasterCard variant. These used to be magnetic strip based cards which have now been replaced by the secure chip cards. As the name indicates, these are more secure and safe to use. Other things to do remember that one should never disclose the important information about the card like Card number, CVV, expiry date, etc. 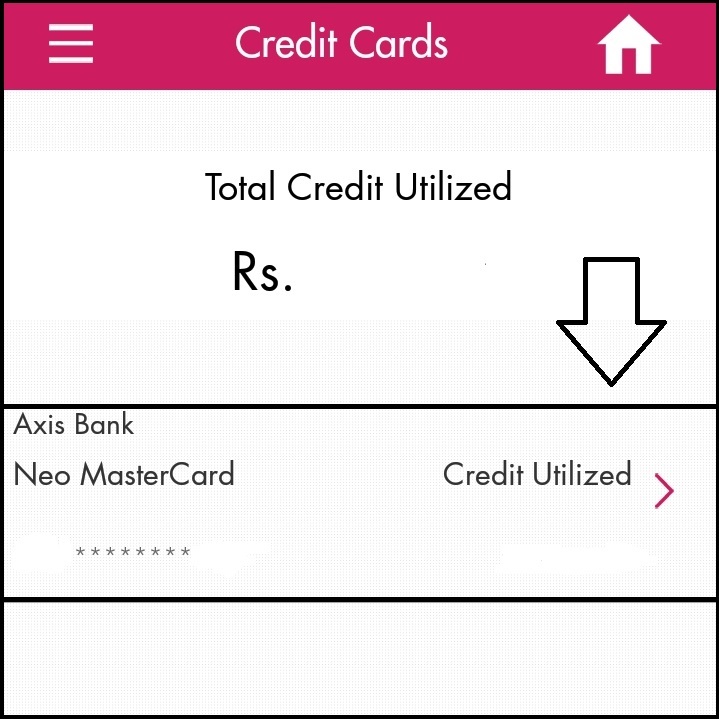 Here in this article, we are going to tell you the process of how to pay Axis Bank credit card bill using net banking. It’s a relatively simple process and you require to have your registered phone number with you. The phone is required in order to enter the netsecure code which will be received before the confirmation of payment. We are simplifying all the steps here along with relevant screenshots to every step. Axis Bank offers a variety of credit cards like MyZone, Neo, MyChoice, Pride, Signature, Burgundy, and much more. The process of bill payment is same regardless the type of the credit card which you are using. 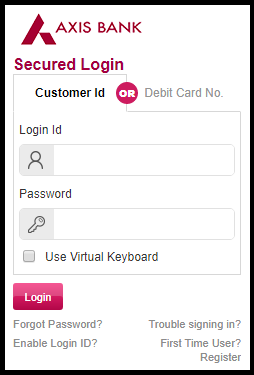 Always remember that you need to be logged into your Axis Bank net banking account before attempting this guide. Open the official page for Axis Bank net banking by visiting the link “retail.axisbank.co.in” You will be presented with the start page of the bank. Enter your login details and proceed to your account. When you are on the Accounts page, click on the three stack menu button from top left and choose “my credit cards” under the cards tab. Select the card you want to pay the bill of, click on “Pay Bill” button. 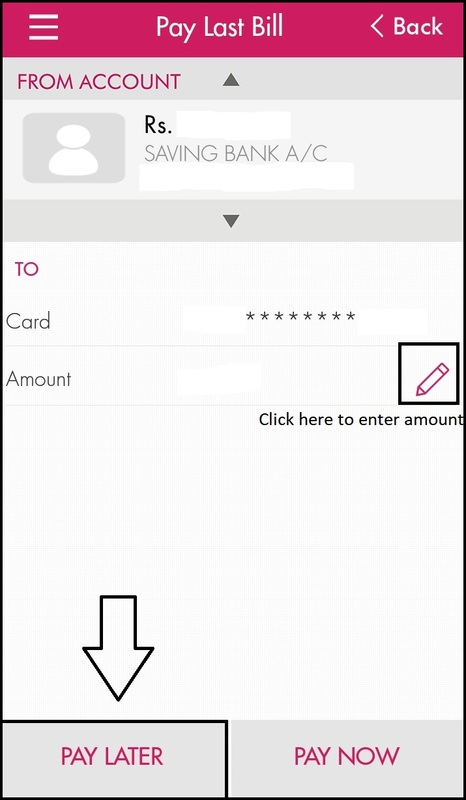 Enter the amount you would like to pay in the respective column and click on the “Next” button. It is not necessary to pay the full billed amount. 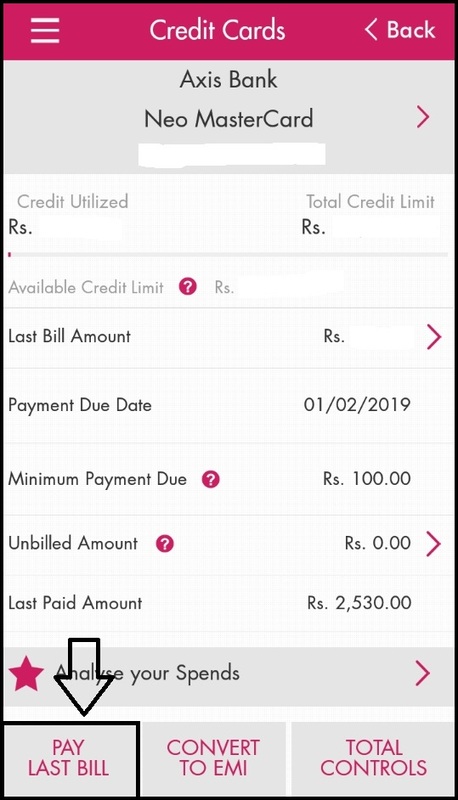 You can pay the minimum due amount and the remaining balance will be added to your next billing cycle without any late fee fine but with interest as per your credit card. Enter the netsecure code received on your registered mobile number and click on “Confirm” button. You will get an email and message on your phone number and email id regarding the confirmation of the payment. Open the official mobile app of Axis Bank which can be downloaded from Google play store as well as Apple app store. Enter your login details and proceed to the home page of app. 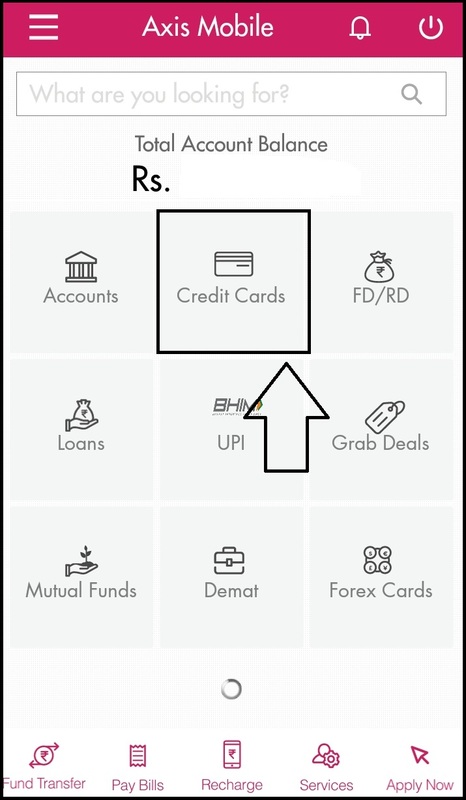 Click on Credit Cards option from the various tiles at home screen. Select the credit card which you would like to pay bill for and click on it. Now, click on pay last bill option at the bottom of page. Enter amount which you would like to pay and click on pay now button. Click on confirm option to confirm the payment for your credit card. Login to your bank’s netbanking/mobile app. 3. Transfer the amount of your credit card bill to the above mentioned details. Do note that payments made through NEFT may take more than one day to clear so proceed with this method accordingly. Open the messages app on the phone with your bank registered mobile phone number. Type CCP “last 6 digits of your account number” “last 4 digits of your credit card number” and send the message to 5676782. Example: “CCP 123456 9898” send to 5676782. The transaction will proceed instantaneously in most cases and you will get a confirmation by the bank. 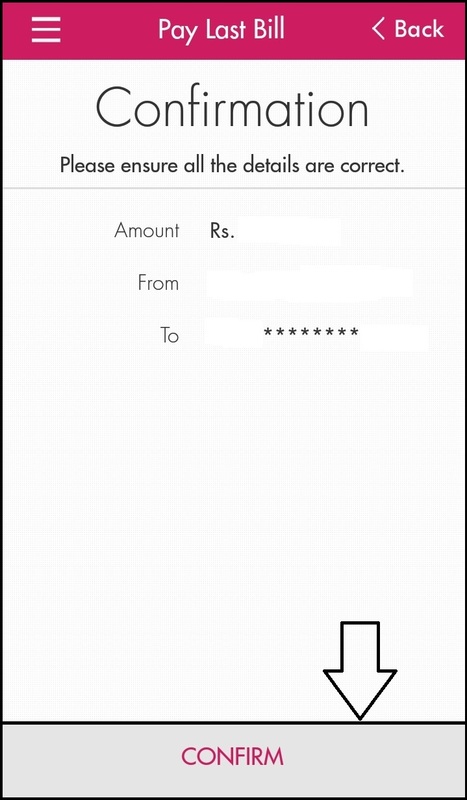 This method can only be used to make payments up to rupees 5000. Visit your nearest bank branch and ask the teller to make payment by cash. Do note that this method will incur 100 rupees as service charge. Draw a cheque/draft with the bill amount in favour of “your digit credit card number” at any of the Axis Bank Branches. Note: Cheque must be dropped at least 5 days before the due date and should be drawn on a local bank. Insert your debit card into the ATM kiosk and enter your PIN. Choose other services option and click on Bill Payment option. Enter the 16 digit credit card number twice on the screen and proceed with the instructions on screen. The account associated with the debit card that you are using will be debited and payment will be processed on same day. 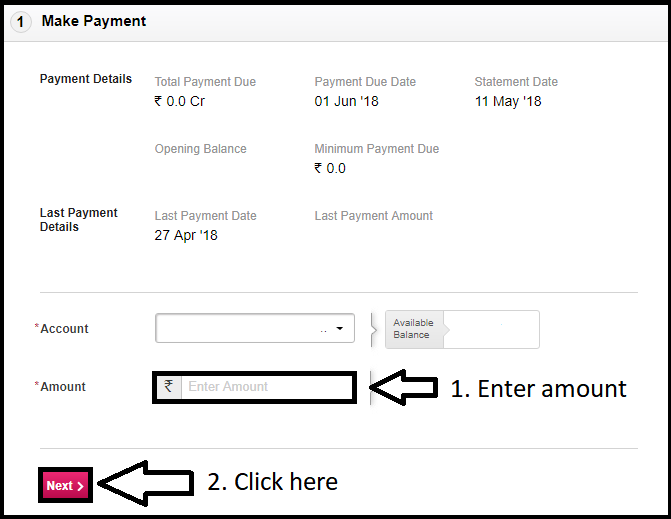 These are the easy steps you are required to follow in order to pay your credit card bill for Axis Bank. If you still face any difficulties, then do mention your problems and queries in the comments section below. We will try our best to help you. For any further support, you can contact their customer support department at Axis Bank customer care phone number.